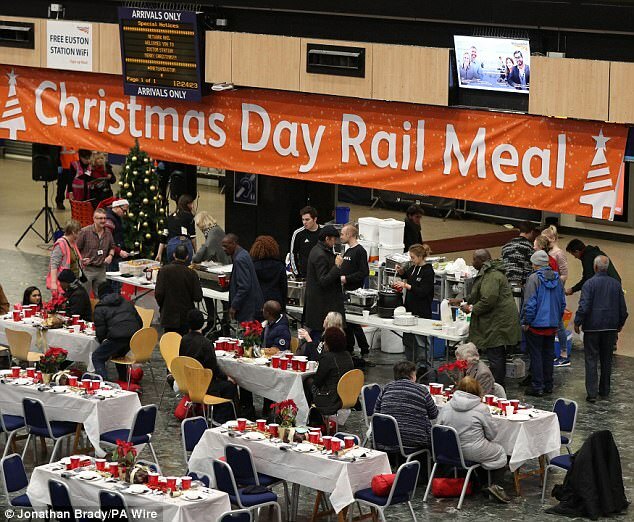 Web News System: Euston station throws open its doors to give hundreds of homeless people a festive feed while its trains are stopped over Christmas. 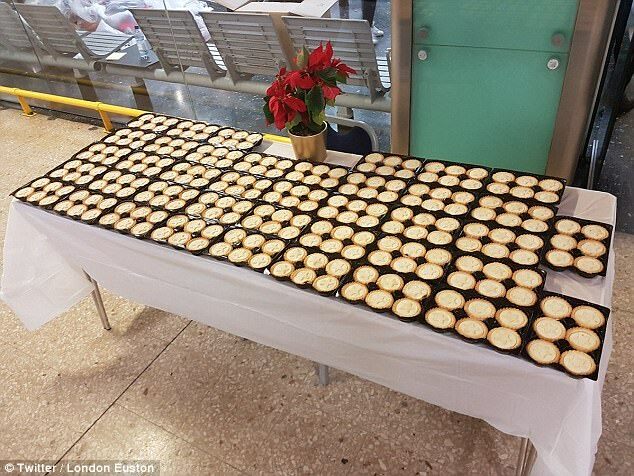 Euston station throws open its doors to give hundreds of homeless people a festive feed while its trains are stopped over Christmas. 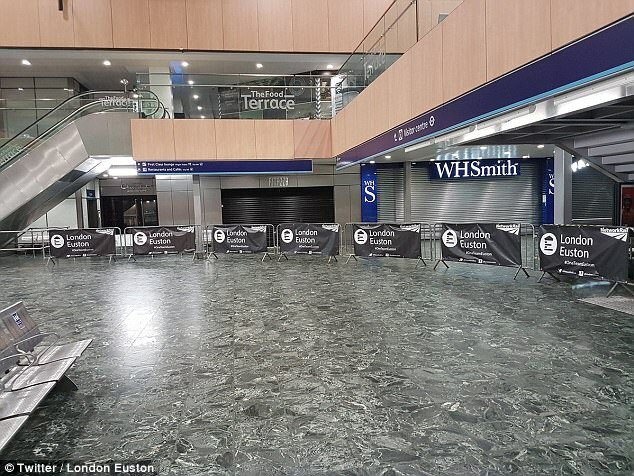 London Euston rail station's staff are already awake and working hard preparing meals for the 200 homeless people they will host for Christmas dinner today. Overnight the station was transformed and filled with tables and chairs. Volunteers are using the hashtag #EustonChristmas to keep everyone updated on the festive event. The first guests will arrive at around 11am for food and will be given a goody bag containing presents, clothes, and toiletries. Around 45 selfless volunteers are giving up their Christmas day to prepare and serve a four-course meal of soup, smoked salmon, a roast dinner and a Christmas pudding for afters. Steve Naybour, a Network Rail engineer who helped come up with the idea, told the BBC: 'We're going to give them the best day that they probably didn't expect a few days ago. Children from local schools have written 200 Christmas cards for the homeless guests, addresses 'To friend'. 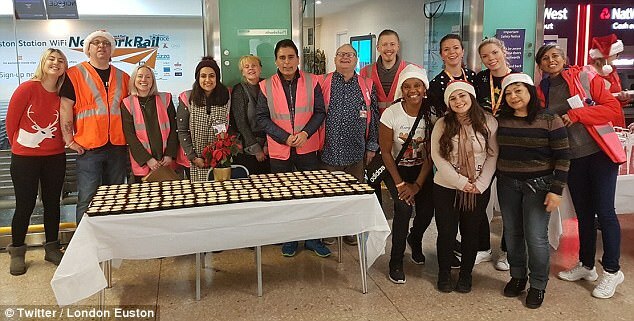 Dozens of volunteers from the rail company, St Mungo's homelessness charity and Streets Kitchen are giving up their time to ensure the event runs smoothly. Rebecca Sycamore, director of development at St Mungo's, said: 'We all can see in our communities that homelessness is increasing and that people are really struggling. 'There's lots of issues that surround that, poor mental health, physical health, relationship breakdown, and obviously it's really, really difficult time. Plenty of restaurants and cafés have opened their doors to the homeless and the lonely today. The Alexandra in Wimbledon have continued their festive tradition of offering free food and drinks for anyone who will be alone at Christmas 'because they like doing it'. The Classic Fish Bar and Kebab House in Birmingham are giving out free meals for the elderly and the homeless today between 1 and 4pm.